Following on from the fantastic bloggers night in at the end of last year, I did a round up of all our savoury snacks and here is a look at the great selection of sweet treats we had the opportunity to try out. 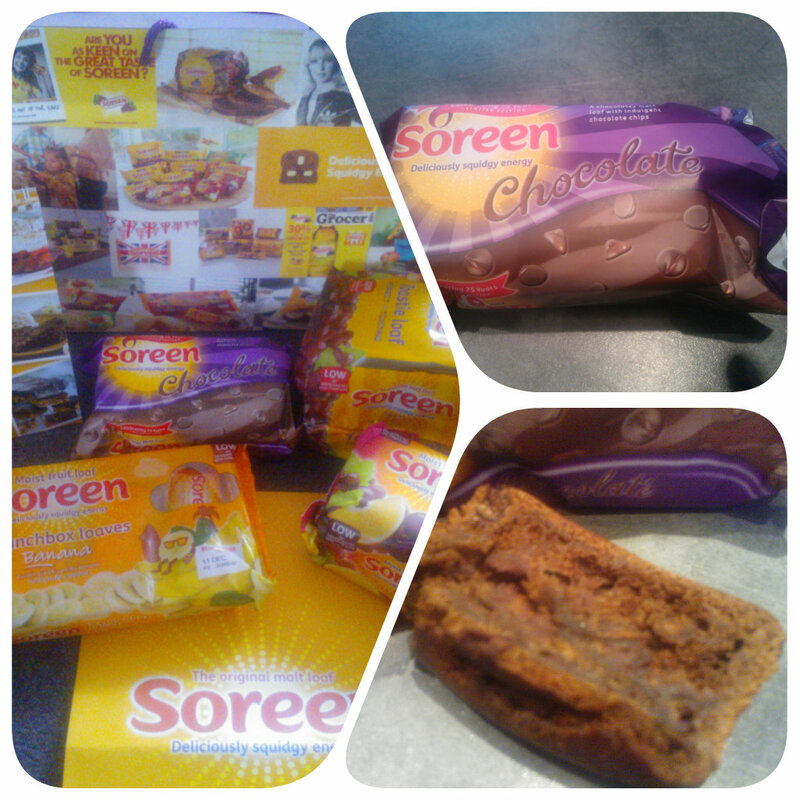 Soreen very kindly sent us each a goody bag packed full of the Soreen range to try. I took this home to my family who couldn’t wait to get stuck in. The Chocolate Soreen stood our for us and is a firm favourite with all of us – it didn’t last long, with a husband and two children devouring it at every opportunity! The fruity Soreen was perfect for the husbands pack lunch box and the sliced loaf made perfect snacks for the children at home. The banana lunchbox loaves are a favourite of three year old Mister B, being individually wrapped I keep them for out of the house or in his nursery lunch box. Overall I have to say as a family we are very impressed with Soreen and think they have made some wonderful additions to their range recently. We are definitely fans and Soreen is always on our shopping list! Green & Blacks, a name we all know well in the world chocolate, kindly gave us a bar of their organic dark chocolate to taste. 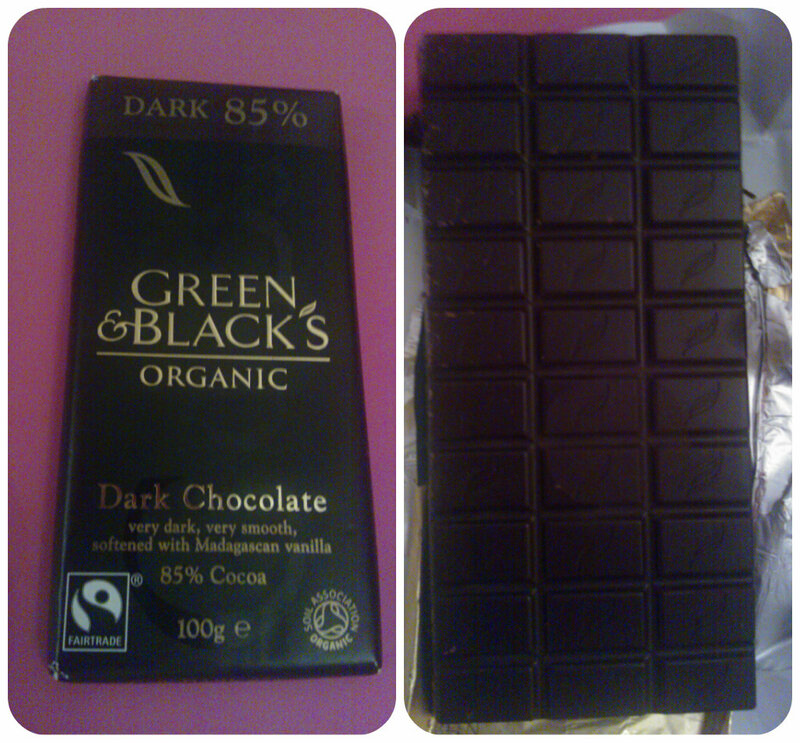 Personally I’m not a fan of dark chocolate but the husband is, so I let him try it for his opinion. He said it was “rich and smooth”, a taste he could savour and enjoy and only needing a few squares at a time meaning it lasting him several nights. A great quality chocolate he enjoyed. 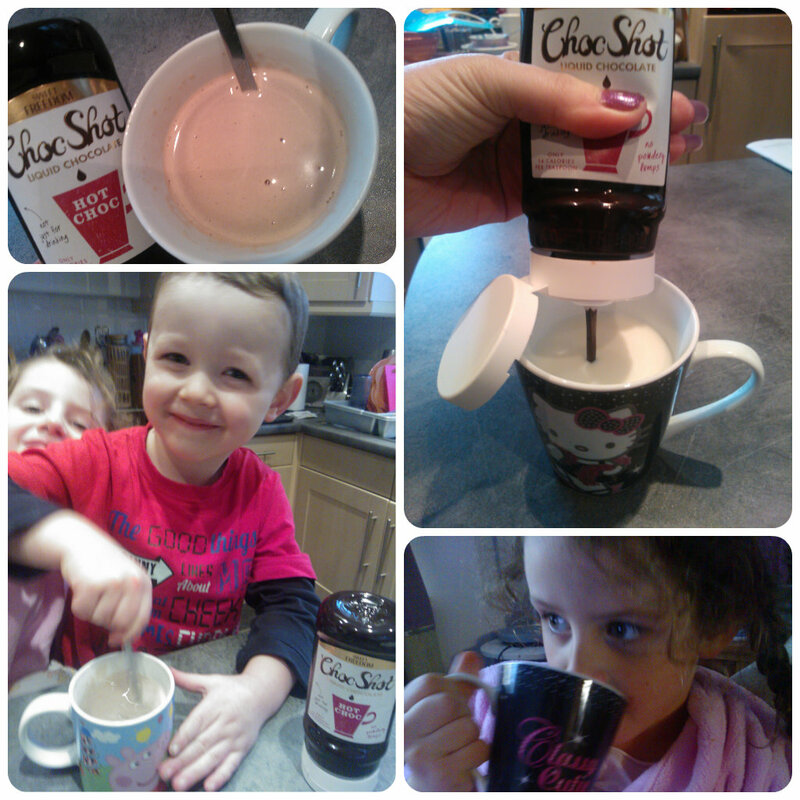 Choc Shot by Sweet Freedom is a revolutionary 100% natural liquid chocolate with only 14 calories per teaspoon. It can be used in multiple ways from hot chocolate, milkshakes to toppings for ice cream, porridge or fruit. Choose your own way of using this multi functioning product. When my children saw it they immediately wanted to make hot chocolate and it couldn’t be easier, no more powdery lumps, just stir into warm milk and there you have a cup of creamy hot chocolate. My children loved it and it was great that they could make it themselves. We also tried it on ice cream for dessert and this was a hit too. The only thing that could be improved is perhaps an easier to squeeze bottle as once we were half way through the rest of the chocolate was a little difficult to get out – apart from that, what a fantastic product. Being suitable for vegetarians, vegans, diabetic and GM, dairy and gluten free this really is a product that anyone can try – why not give it a go? Another brand we tried that caters for special dietary needs is Orgran, a top brand in the gluten free food market. All Orgran products are Gluten Free, Wheat Free, Dairy Free, Egg free, Yeast Free, GMO Free and Vegan. 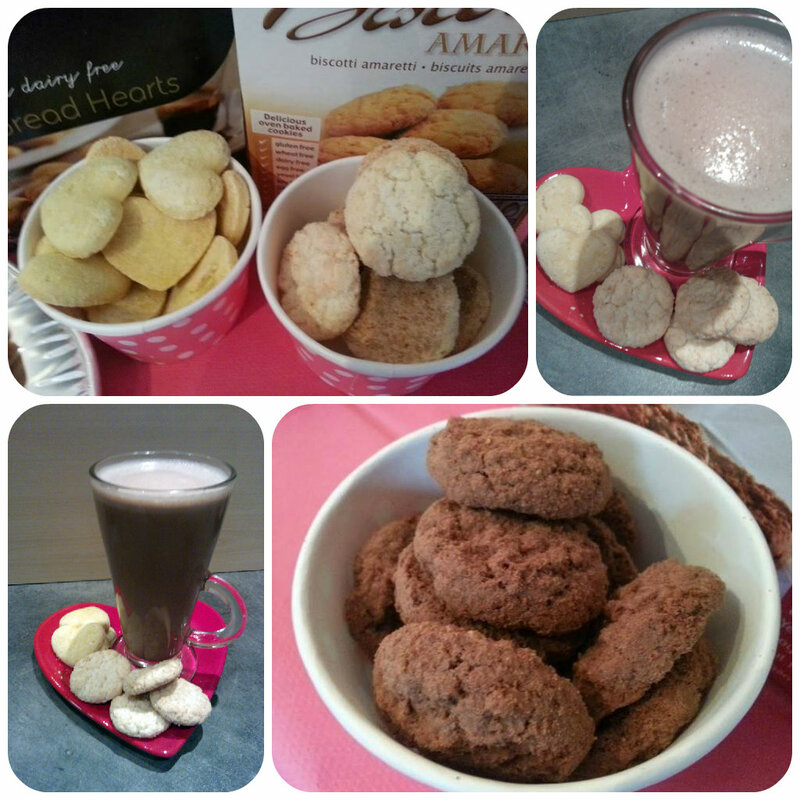 We were sent a selection of sweet treats to try including shortbread hearts, Amaretti biscotti and chocolate biscotti. We did find the shortbread hearts a little hard and not quite the crumbly shortbread texture that we are used to but they did look pretty on the plate. The biscotti were nice and I did like both of the flavours. I took some samples home and found that they make the perfect accompaniment to Sweet Freedom’s Choc Shot. I think for someone limited to certain dietary requirements, then these Orgran biscuits are the perfect treat. They all look good and are perfect paired with a hot drink to dip in. If you are following a gluten free diet then I’d definitely recommend checking out the Orgran website as they have a wide variety of food choices and even a great range aimed at children following a gluten free diet. Darling Spuds have brought out a sweet and salty popcorn. They come in handy size snack packs and I left the pack I had for my children to try. I did intend on trying one or two pieces myself but by the time I came back into the room they were gone! I think that speaks for itself – they obviously taste good and were a hit with my two. These are great as a snack and another that is gluten free along with being suitable for vegetarians and coeliacs. But the best feature has to be there are just 39 calories per bag!! 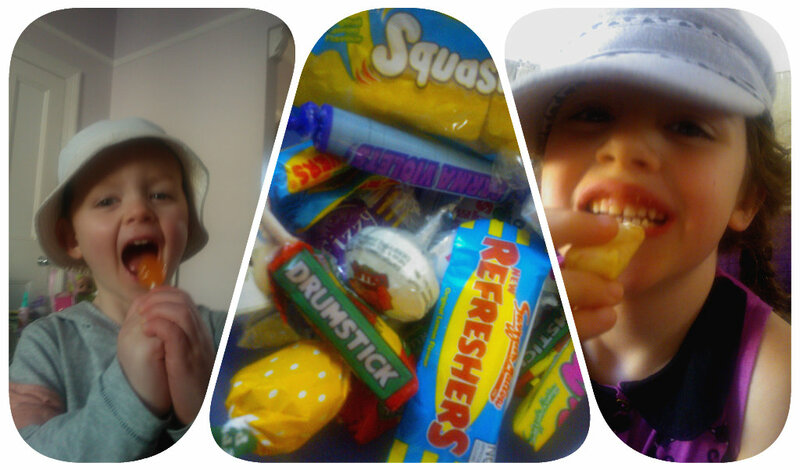 When I opened my bag and showed my children the Swizzels-Matlow goodies, their eyes popped out in excitement! Can we have one now they asked? With traditional favourites such as Love Hearts, Drumsticks and Fruity lollies my children were in sweetie heaven – oh but I did keep the Parma Violets for my handbag though! Last but not least I have saved you the best till last. When I was offered my favourite ever chocolates to review how could I refuse. 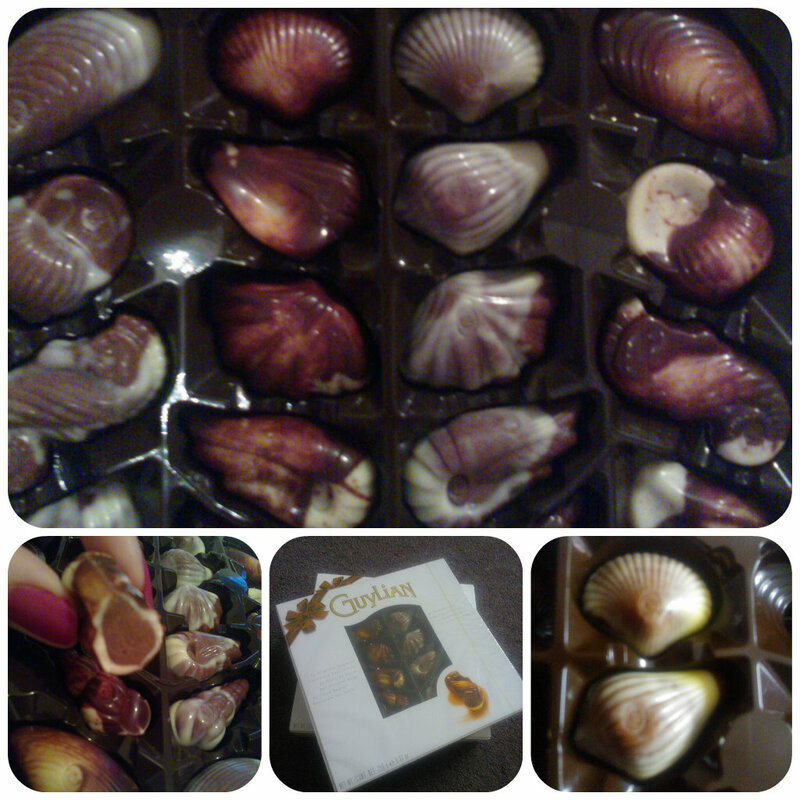 Guylian, the Belgian chocolate seashells are made from 100% pure cocoa butter with a unique hazelnut praline filling that is utterly divine. The distinctive, glossy seashells and seahorse shapes are a sign of quality, a box of these is perfect as a gift for someone being affordable but luxury chocolates at the same time. I highly recommend these!! All reviews are my own and my family’s opinions and we received the products in order to write the reviews.